Crystal meth is an extremely dangerous drug that has caused enormous harm to people who indulge in the recreational use of this substance. It’s also an extremely addictive drug. The really insidious feature of meth is its ability to convince the user that nothing is amiss, even as their body deteriorates and their interpersonal relationships fall apart. For the crystal meth user, the enormous dopamine rush it triggers can override all other considerations, but the toll of meth eventually becomes impossible to ignore. The novice meth addict soon begins to experience the downsides of this drug, such as sleep deprivation and episodes of intense anxiety. As the weeks and months go by, the physical disorders pile on: chronic mental confusion, tooth decay, depression. The user may even experience permanent damage to the lungs, liver, kidney, or brain. Fortunately, there is a way out of this maze. Yellowstone Recovery has helped many addicts abandon their harmful habit and return to normalcy. One of the keys to recovery is becoming adequately educated as to the true nature of meth. 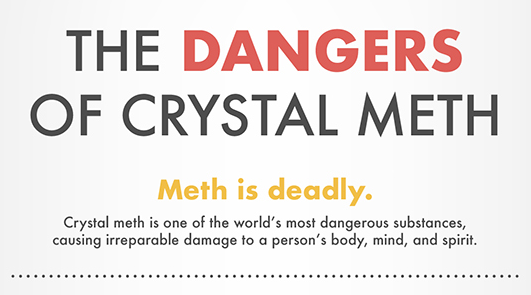 With that in mind, we’ve put together this handy infographic to provide you with an overview of crystal meth and its destructive potential.